In December and January of this year, I had the opportunity to intern at Manos Abiertas, and it was an incredible experience. The clinic offers full-scope women’s health care… everything from well-woman annual exams, to fertility counseling, to problem-solving, to counseling, to caring for sick women, pregnant women, attending labor and delivery, and everything in between. I was able to observe almost every type of visit and procedure imaginable, and I was also able to observe that the waiting room got more crowded and crowded every day as satisfied women passed along the referral to their friends and family. It is unfortunate that respectful, empowering, and patient-based care is not the norm, but it is clear that when women find it they will not settle for anything less. Patients came to Manos Abiertas from across the country, taking 3 and 4 hour bus trips to seek care. Patients told stories of other clinics they had visited, where they never received results, where procedures and medications were not explained, where their birth control was unreliable and suddenly unavailable, and where they were c-sectioned unnecessarily. Manos Abiertas offers something different, and it is clear that it is needed. One of the most extraordinary things about Manos Abiertas is the home-birth atmosphere that they are able to offer to their clients. Women labor and birth in a quiet, comfortable, homey environment, surrounded by their family and friends (and sometimes half of the village …). They are able to deliver naturally, and usually go home to their family the next day. The new baby is celebrated and fussed over by the clinic staff, and the mom is at the center of all of the action. Below are the stories of the births I was lucky enough to attend at Manos Abiertas. The first birth I attended (EVER) was a little 17 year old named Pati, and she came in with her mother, her husband, and her sister. Hannah could tell from the beginning that the baby had some other part than its head coming first, but couldn’t figure out what part (and the baby had been head down at its last prenatal visit a week before). Pati labored quickly, in about 3 hours she was ready to push, and she barely made a sound. She was just focused, breathing, working SO hard, and towards the end napping between contractions. The next time Hannah checked her, she felt a foot… and indeed, Juan David came foot first, (actually, one foot and his balls) with both arms over his head. It is an extremely rare presentation, and an extraordinary birth to witness, both for the technical skill that Hannah showed and for the bravery of the mom. Pati’s mom was really cool, and so proud of her, and Pati’s sister was scheduled to have her baby with Hannah the next month. The second birth was at the water birth center that Hannah owns, and it was a woman (Emilie) who came late in her second pregnancy for care. Emilie had had a cesarean with her first birth (they induced her, and after 4 hours of labor said that she wasn’t progressing fast enough and cut her open) and the doctors were threatening another cesarean due to “lack of fluid.” Hannah thought it was B.S. and agreed to care for her. Emilie came to have her baby with her husband and sister, and it was a really FUN labor… they laughed and told stories and giggled the whole time, and Emilie labored much of the time on the toilet (and she recommends it!). The labor and birth were fairly straightforward, and they had a beautiful baby boy, Andre. The two things I will never forget are: 1) I messed up draining the birth tub and it overflowed, leaving me crawling around and mopping up fluid for what felt like hours!! and 2) Emilie and her husband came back to talk to the childbirth class that they were part of before the baby came (that Hannah teaches). Emilie had been transformed by the birth, and by her own power… her husband (almost 20 years older than her) told the group that he looks at her totally differently now, and is amazed by her strength, and Emilie said that she felt like she could move mountains. The third and fourth babies came on the same night!! The fourth showed up early, a young girl of 15 (Nancy), because her water had broken but she was not having many contractions. Officially, her baby was premature, but there were some conflicting ultrasound dates, she wasn’t sure of her last period, and the baby felt (to Hannah) to be about 8 months along and safe to deliver. She looked like she was going to labor all night, so we all went to bed to rest up. Pretty soon after, Sandra, another assistant at the clinic, woke me up because another woman had come in (Ana). This was Ana’s sixth child, and she was as calm and focused as Pati had been a few weeks before. Ana was at the clinic for less than an hour before she delivered her daughter (5th daughter… they were a little disappointed!). Ana also was anxious to leave the next morning… because it was her day to wash clothes, and she needed to get back home. By this time Nancy’s labor was heating up and she was quickly spinning out of control, as she had no idea what to expect and was just freaking out, and screaming her head off! She also brought half of her village with her, and because the night was freezing cold, they were all in the room. When she finally started to push, she would jump off the bed, squat, jump back up on the bed, jump to the other side of the bed… just back and forth like a frightened animal. She finally delivered a beautiful baby boy. The last birth was with a woman named Maria. She had had two babies, both delivered by cesearean. This was an interesting one because the babies heart rate was really low and not changing at all (it can be low, as long as it is fluctuating). We gave her oxygen, we had her squat, lie on her side, stand up, any number of things to try and get the baby’s heart rate up. Nothing, and things were getting tense, to the point where it was almost time to talk about transporting her to the hospital. Finally, we had her roll over to her hands and knees and VOILA… heart rate back up and healthy. The cord must have been compressed in all other positions. One more baby born wailing and healthy. One of the biggest things that I took away from all of this is that four of those five women would have had a cesarean if they had been in a hospital, particularly a public hospital. The c-section rate in Guatemala is shocking, and seems to largely come from doctors being in a hurry (lots of patients!) and having inadequate training in obstetric techniques. They also get more money for performing a c-section than a vaginal delivery (as is the case in the US as well), so that might have something to do with it too. But these babies were gorgeous and healthy, and got to snuggle with mom a milli-second after coming out. Moms also didn’t leave the clinic until they were feeding okay, and I watched Hannah spend an hour with a new mom helping her coax her baby to take her breast. It was really amazing, and I learned SO MUCH. I am so grateful for the time that I spent watching this little clinic thrive. I would recommend the experience to anyone, and also urge funders and donors to consider supporting MORE clinics that are able to capable and compassionately serve women through their lifespan. I just talked to the future grandmother, who has been up with her daughter all night. They speak Quiche, and she told me that in this idiom, one of the words for “midwife” is the equivalent fo “buyer, negotiator”, since she is the person to negotiate the cost of the new life on earth. In the Mayan legends, “Iyom(? )” means grandmother, and also refers to the midwife, who has a big responsibility for the baby to be born. No wonder the current politics on midwife education are not very successful… they do not take into account the standing of the midwife in the community and the respect she is owed traditionally. …obviously not at the new center yet, but in Guate, at the Centro de Parto Natural. We have been up in turns during the night, Gabi and I, to look after Angela, an indigenous woman at 42 weeks of pregnancy. She came in at 11.30 pm and now, at 9.00 am, is pushing. The baby is an estimated 9 lbs and Angela is about 150 cms tall…this is still going to take awhile! Yesterday we chose the colors for painting the future birthcenter&women’s clinic in Ciudad Vieja. in the afternoon I had appointments here in the city, and told everybody about the new project…a client says her office is buying new desks and we can have the old ones! And yesterday Terry from our local ad magazine donated three months worth of classifieds to ask for donations for the project. Well, it looks as if I will be blogging, just like the rest of the world. Quite ironic, since I chose my profession believing that I would be as removed as possible from technology, as a homebirth midwife at first, then as a midwife at my own birth center in Guatemala. but for this project about to start, I believe it is important to get out there, to the people who are supporting it and need to know what’s going on, for the people who are interested in doing an internship with us and need to know what it’s like, and also for me, so I can monitor what we are doing, our problems and the solutions we decide to try, the feedback we will hopefully get from the community. Now, what is this project? No. Not yet. First a little about what I’ve been doing the last 15 years, since this is vital for what is happening now. After returning from MATERNIDAD LA LUZ ( in 1995), the most incredible place to study midwifery, I started to attend homebirths in Antigua Guatemala, where I live. Soon after, with a partner, we started IXMUCANE, a birthcenter. 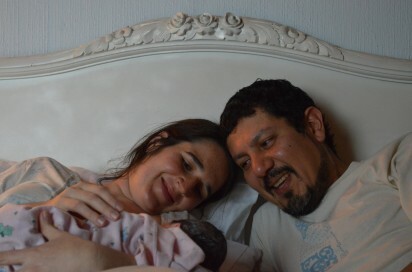 After two years I decided to split and take over a waterbirth center in Guatemala city. The owner was going back to the States and I had a hard time with my partner in IXMUCANE, so I took over. So since 2,000 I have been attending births in the CENTRO DE PARTO NATURAL, in Guatemala City. We do on average 4 births a month, the clientele is half Guatemalan , half foreigners. Besides births we do comprehensive prenatal, postpartum and Gyn care, mostly using alternative therapies and herbs. I have been taking interns from all over the world and since last May I have a steady assistant, Gabi. Now I finally get to sleep once in awhile! To my great surprise, last August I got an offer from PPFA to start a project for low income women in a place I could pick and to my specifications. This is the project about to start: a complete women’s health center for low income women in Ciudad Vieja, Sacatepequez.